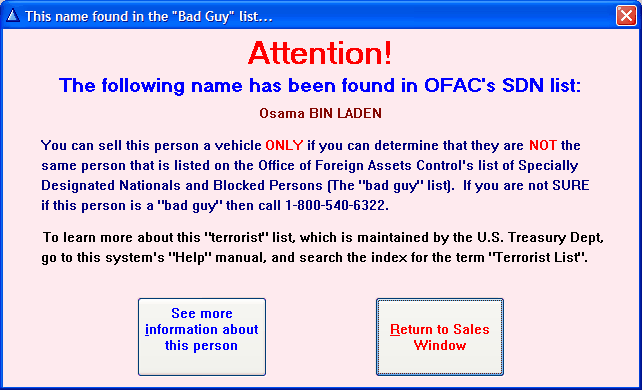 The "Bad Guy" list is maintained and provided by the U.S. Treasury Department's Office of Foreign Assets Control (OFAC). The list is called the Specially Designated Nationals and Blocked Persons list (SDN). The Frazer system will automatically check this list every time you enter a sale or take a payment to be sure that your prospective customer is not on the list. You are not allowed to do business with any people on this list. FRAZER will keep this list current through the updates that you receive. You can even update the list yourself to stay even more up-to-date. To learn how click here. The fines for selling a vehicle to somebody on the list are quite steep: $5 million fine and 30 years in jail. Don't confuse this requirement with the "anti-money laundering program" requirement of the USA PATRIOT act. The SDN List requirement has been in effect for some time already, but has only come to the forefront as a result of the events of September 11, 2001. If the listing on the SDN List contains both a first and last name, the FRAZER system will provide the warning only if you enter both the first and last name exactly as it appears on the list.